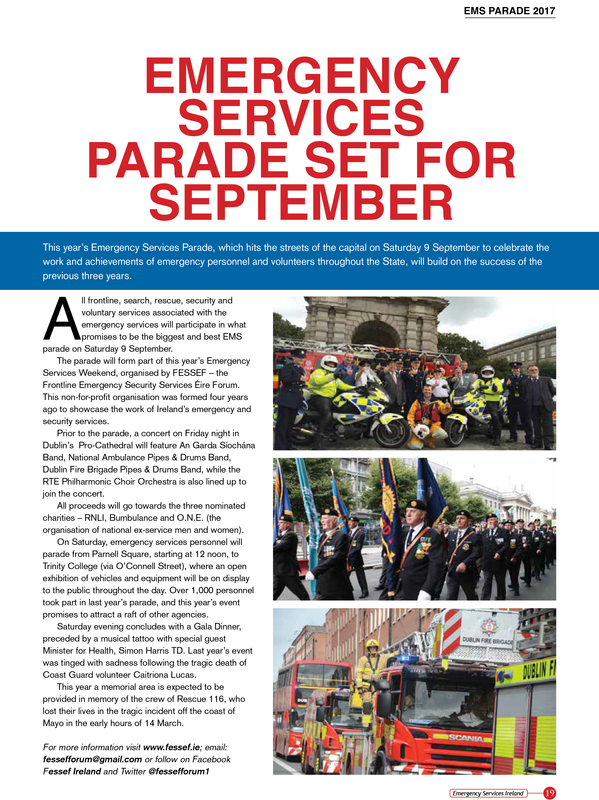 For information on this years parade and events, please visit the National Services Day website below. The FESSEF Committee are proud to announce the 2017 Emergency Services Weekend from 8th-9th September 2017 shall be themed as a weekend of CELEBRATION, highlighting the work of the emergency services and the achievements of the staff and volunteers throughout the State. 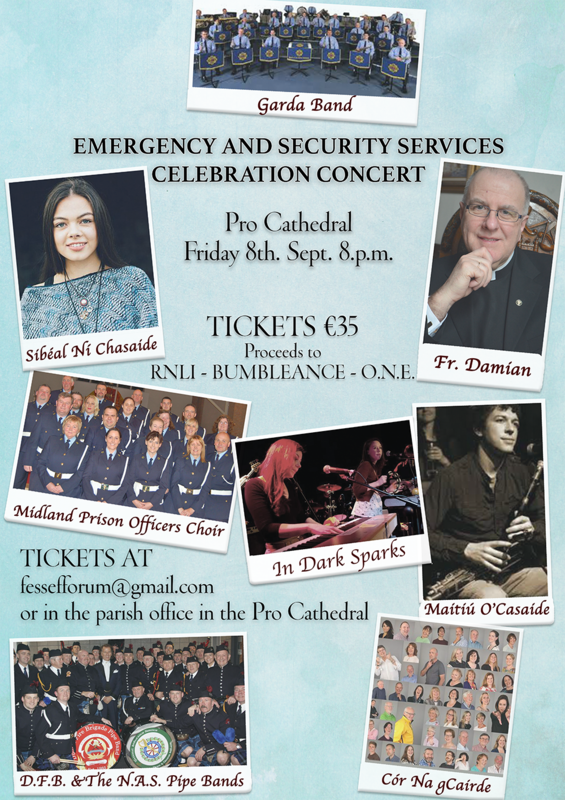 By kind permission of His Grace the Archbishop of Dublin Diarmuid Martin, the FESSEF Committee shall host a musical concert showcasing the massed bands of the services with special guests in the City’s Pro Cathedral. Proceeds to charities: Tickets €35. The 2017 Parade commencing at 12 midday from Parnell Square to Trinity College via O’Connell Street promises a special opportunity for all the family to see the band’s, vehicles and personnel of Ireland’s emergency and security services. 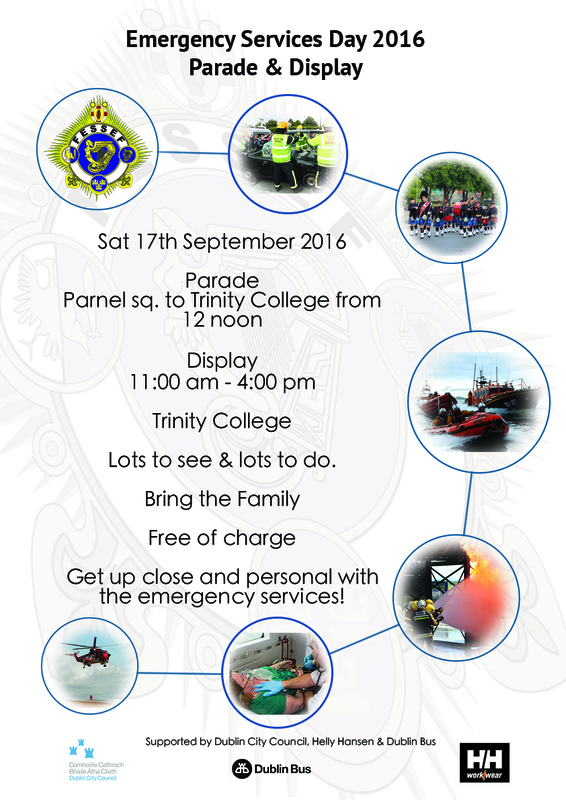 The main courtyard of Trinity College shall see all the participating services and personnel open to the public from 11:00-16:00, to showcase the services equipment and capabilities. The public can get up close and personal with every service for Free. Saturday’s celebrations shall culminate with the annual Gala Dinner in Trinity College Dublin, preceded by a musical tattoo. Tickets €50 in limited supply though the FESSEF Committee. FESSEF is a not for profit organisation promoting the work and personnel of Ireland’s emergency and security services through friendship and partnership. I, on my own behalf and on behalf of the FESSEF committee would like to take this opportunity to pay tribute to all who took part in the Annual Services day commerations. Your contribution on the parade and at the display made it the huge success that it was. We now look forward to next year and hopefully to bigger and greater things to come. In 2014 we paraded along the quays and hosted a display in the Royal Hospital Kilmainham. Whilst successful our engagement with the public was minimal. In 2015 our parade took in O’Connell Street and blessed with fair weather, greater numbers of public were able to get up close and personal with our members. 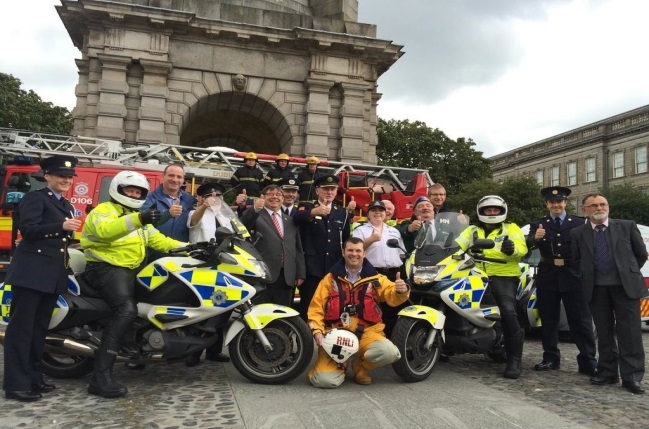 Learning our lessons and building on the past experience I am confident that billed as “Dublin City Emergency Services Day” 2016 shall again see us further advance our mission. This year the committee took the decision to have as its theme SAFETY and for the gala dinner REMEMBRANCE for all deceased members of all services. Working in partnership with the Road Safety Authority and Water Safety bodies we hope to encourage the general public to be ever mindful of the dangers of our roads and waters. What a success it turned out to be and we were also blessed with great weather which added immensely to the enjoyment of the occasion. At the heart of FESSEF is our committee comprising voluntary representatives from An Garda Siochana, National Ambulance Service, Irish Coast Guard, Royal National Lifeboat Institution, Irish Prison Service, Dublin Fire Brigade, Dublin Airport Fire Service, Irish Civil Defence, St John Ambulance, Order of Malta, Oglaigh Naisiunta na hEireann, Irish United Nations Veterans Association and HSE, Blood Bikes and mountain and river rescue teams These individuals work tirelessly and with great determination throughout the year to pull together this wonderful day and gala dinner. I hope you join with me in acknowledging their individual contributions to Irelands emergency and security services. This year we also welcomed the R.S. A. and the Water Safety Authority on board. We are supported in many ways by many people in our work, from companies who have purchased adverts or made donations. To our key sponsors of Dublin City Council and Helly Hanson without who's financial backing the day would not happen. Mr Brendan Kelly, CEO D.C.C. and their event management team, the Provost and staff of Trinity College and all those who have contributed to FESSEF I thank you. The events of Sat. the 17th have further cemented the great friendships, partnerships, relations, understanding, common aims and comradery between so many services and organisations. Year on year I hope we continue to build upon this established annual event and collaboratively promote the work of our emergency and security services. Most importantly this year I hope our work today impacts in some small way to preventing the heartache and tragedy we all too often witness on our roads and waters. I once again thank you for your support and I very much look forward to welcoming you back next year.